I’m a seasoned Personal Trainer, recognized by both clients and peers as a tremendous motivator and goal-oriented professional. Focused on results, I bring more than 25 years of experience in the health and fitness industry to achieve effective personal training and a balance of both physical exercise and appropriate nutrition. I have taught both corporate and adult group classes, high school Physical Education as well as customizing fitness programs for individual clients. 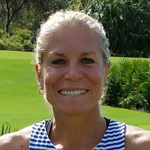 Before recently relocating to Naples, I served as Fitness Director and Personal Trainer at the Bradenton Country Club for more than 15 years. Living a healthy lifestyle is a personal matter of making the right choices. Choosing to implement a consistent regimen of physical exercise, a diet involving more fruits, veggies and portion control, and an attitude of positive thoughts provides fantastic results! Take advantage of our April Spa Special! Looking to try something new? The Pilates Reformer is a great way to build strength and flexibility! Kimba’s offering a complimentary first time session for new clients. Valentine’s Day Special with Kimba! Get 10% off your first Pilates Reformer session in the afternoons for February!